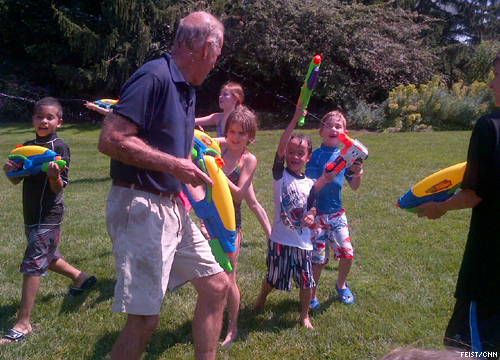 Vice President Joe Biden distributed water guns to children at the annual media picnic he hosts. Washington (CNN) - Vice President Joe Biden's cordial annual media picnic turned into an all-out war between the vice president and children of journalists in attendance. The vice president distributed high-powered water guns to the children gathered at his official residence and identified notable journalists for them to pursue. Among the targets were CNN's Wolf Blitzer and Politico's Mike Allen. Biden's team of warrior children then turned their weapons on the Vice President himself. Before it was over, Biden was super-soaked and smiling. At least he was armed, albeit outnumbered. Good for you, and good for all children. unlike Romney, Biden is made of blood and flesh, with human touch with real people, including kids. I'm sure this was funded by the taxpayers... what a waste – get back to work, Biden! We have unemployment on the rise and all this clown can do is say "screw you America, I'm gonna play"
Finally, they found something that suites Biden's IQ! So this is how they spend our stimulus money? Good times. This is why I love the whole Biden family!!! Irrespective of my differences with the VP, I like this. Now if we could only have a barbecue for the full congress and let them go at each other with super soakers! I suspect they'd get along a lot better afterwards. Looks like fun, Grandpa Joe!!! Where was the secret service? I demand a congressional investigation! Nothing new...he is all wet anyway. Sure sounds like more of what's to come. If Biden wins as president in my lifetime, I'm definitely moving to Europe. I'm cashing out my entire 401k and transfering the money to a French bank. I'm then going to still draw my US social security on a US bank account and spend it fully in Europe. I am serious enough to meet with a European immigration attorney and work out the details of what it takes to move to Europe. Of couse I could just take a freighter to Greece and sneak in there. I could live in Europe without a visa until discovered. But if Biden is president, I'm going to go through the trouble to do it legally. I just cannot stay in a country who would elect such an unbelievable imbicile. Do the media follow him when he goes to the restroom also or when he blows his nose? WOW! He is all wet again isn't he? Have you been squirted by fruit juice using that water gun? The VP is just a nice average guy. Maybe this could be one of the other things the Vice Pres does, since he has no job description. The VP sometimes takes abuse intended for the President anyway. Lets call it the department of abuse. I bet someone complains that he gave the kids 'guns'. A good water fight never corrupted any of my children.